Dr Adam Claasen’s Dogfight. The Battle of Britain is one of the first titles in the Anzac Battles Series. Edited by Glyn Harper, the series is devised specifically for an Australian and New Zealand readership and focuses on the great military battles of the twentieth century in which Australians and New Zealanders participated. Dr Claasen was the right person to pen this worthy inclusion in the valuable series. As well as the author of Hitler’s Northern War: The Luftwaffe’s Ill-fated Campaign, 1940–1945 which did much to widen our understanding of the Third Reich’s way of war, he is a senior lecturer in modern history and international relations at New Zealand’s Massey University, specialising in the Second World War and the role of air power in military campaigns. 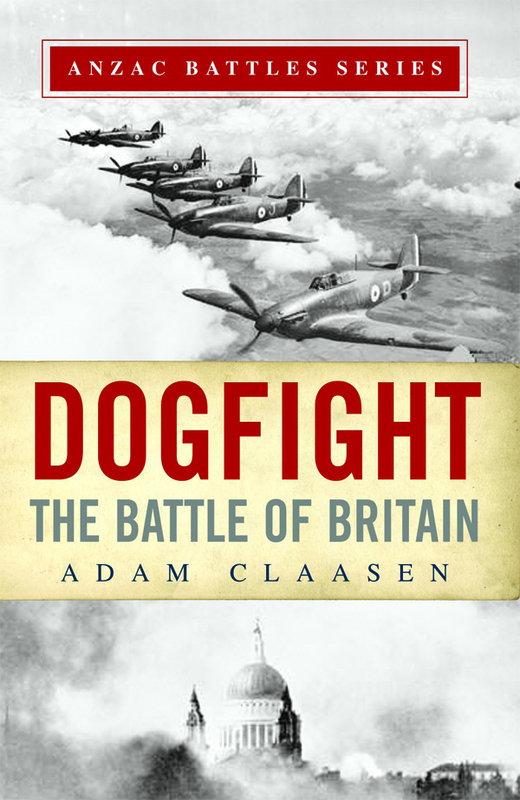 When Dr Claasen first embarked on his research into the Battle of Britain, he was asked the same question every researcher is asked when putting their foot into a pool that has been saturated by accounts from official, mainstream and niche publishers: ‘Do we need another book on the Battle of Britain?’. Happily, he was not put off by the implied negativity of such a query and realised he was in fact being asked, ‘What will you be offering that’s new?’. By separating the deeds of the Anzac airmen from those of their allies and stressing the important parts played by New Zealanders Keith Park and Archibald McIndoe, and then analysing their overall significance, Dr Claasen has indeed offered something new and valuable. Before proceeding, I must say that Dr Claasen and I differ on some points. For instance, he accepts Dennis Newton’s tally of 37 Australian pilots and gunners participating in the Battle whereas I tend towards the Office of Air Force History’s ‘30 or so’ but if pushed accept the 32 acknowledged by the Battle of Britain Historical Society and the Battle of Britain Monument. Disagreements over the totals are par for the course in Battle of Britain research—even official sources vary in participant totals—and they in no way detract from the importance of Dogfight. Dr Claasen is not distracted by the discrepancy debate. He highlights some of the problems with totals, acknowledges his debt to Australian Dennis Newton and New Zealander Errol Martyn, and simply gets on with the story. Dr Claasen follows the general Battle chronology but many of his sub-chapters are thematic. These changes in perspective—from action to analysis or discussion—are deftly handled. He wastes no words, doesn’t get bogged down with detail or thump the reader over the head with his opinions. Nor does he build up a story for dramatic impact. One of the best examples is when it finally hit Gordon Olive why he did not have a high kill rate. Dr Claasen leaves it to Gordon to convey the emotion of this episode, allowing the reader to gain the full poignant impact of a man acknowledging that he had to kill his former friends. Perfectly countering the tragic stories such as the death of Donald Cobden on his birthday, Dr Claasen liberally sprinkles Dogfight with humour, and Alan Deere’s ‘oxometer’ and John Gibson’s concern over the fate of his handmade shoes after his bale-out are two of the small joys of this book. Storytelling aside, Dr Claasen has a gift for précis. His concise summary of the skills of the fighter aces is one of the best I have read and he ably presents the technical differences between the Spitfire and Hurricane so they are readily grasped by the lay reader. His analysis of why the bulk of Battle of Britain victories were at the hands of a small percentage of The Few is nothing short of brilliant. His approach to the complexities of killing in warfare and his discussion of morale are first rate. Indeed, this is a first rate account of the Battle of Britain and the significant part played by the Australians and New Zealanders. Silly errors aside, I highly recommend Dogfight as both a good, accessible read and a fine research tool.